How much water do you run down the drain waiting for the cold water in your hot water pipes to clear through your shower or sink? A hot water recirculation pump could reduce this water waste not to mention eliminating the wait time for you. A family of four can waste as much as 12,000 gallons of water in a single year waiting for the water to warm up. ITT – Bell & Gossett Pumps has a solution for your home that operates on the same power it would take to operate a night light. In this video Marianne Szczech of the ITT Residential and Commercial Water group will explain how their products can help you eliminate this water waste as well as showing you a solar powered circulation pump. This can be utilized to circulate the glycol in a solar thermal hot water system allowing the sun’s energy to not only heat but also deliver the heated fluid to the hot water storage tank. 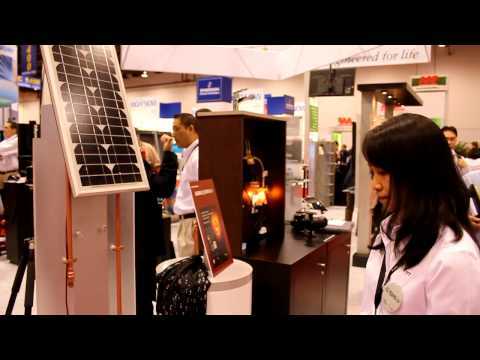 This video was filmed at the ITT booth at the 2011 AHR Expo in Las Vegas.